Before I start today's post, I would like to thank Stampotique for having me over at their blog as guest designer for this month. I had a great time creating for them and as always a great pleasure to play with their unique stamps. Today's card is the second card I made for the ''Favorite holiday'' theme and for that, I wanted to use the cute ''Dog family'' stamp. At some point in life we will get to appreciate the family and the moments we spend with them much more and a family holiday is always welcome and full of good times. I kept the card pretty simple,but this time I added a small sentiment from a washi tape I had in my stash and for coloring the stamped image, I used NUVO markers from Tonic Studios. I like how simple, yet cute this card is. I hope you enjoyed the cards I made for Stampotique and that you have some inspiration to try something new . You can always check out Stampotique Designers Challenge for some inspiration or why not join their challenges. That's all from me today. As always, thanks for stopping by and have a great day! If you don't know or maybe you missed this,but there is a Facebook group called : Challenge Card Swap. Is a group for all cardmakers and we have monthly card swaps with a little twist. As cardmaker I love making and sending cards. What's great about this group is that we have a challenge and you also make extra challenges for your swap partner. This month we had to choose between a color palette or sketch and add extra challenges. My swap partner,Alina asked for the sketch and added the ''home'' theme and washi tape. Here is what I came up with. I must say that this was a real challenge for me, because I don't think I made a ''home'' themed card before. I also wanted to use my pattern paper as I don't really use it so much lately. The little house is from Prima and I had it in my stash for so many years. It was perfect for this challenge. 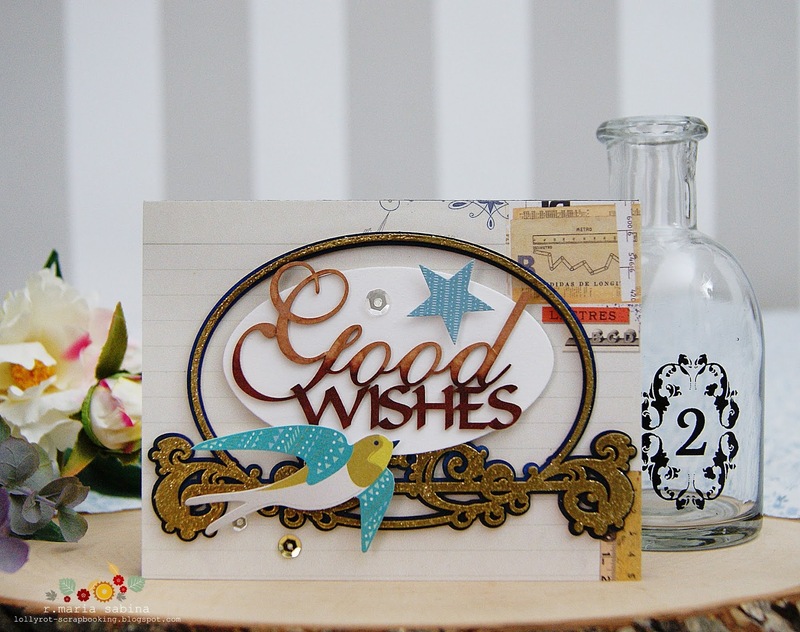 You can join us and just share your love for cardmaking. Hope to see you there! As always, thanks for stopping by and I wish you all the best! I am back today with a new card I made for Stampotique , for their new theme called ''Favorite Holiday''. I don't really have many favorite holidays, but one of them is Halloween. Now, I don't celebrate Halloween, but I still like the idea of a spooky day and being able to dress up in many ways and yet not feel creepy . For today's card I decided to go with the Halloween theme,because Stampotique is unique and they have some creepy designs that go so well with today's theme. I love the background so much! I wanted to have the look of the full moon and the ''Owl tree'' and the ''Frankie'' go really well with the background and the theme of my card. Stampotique has a great collection of Halloween stamps. You can check out their website for more designs. That's all for today! Don't forget to come over again! I have one more card to share for Stampotique. Coming up very soon! We should always focus on the good and no matter what, we should keep a positive view over things and life. That's the sentiment I used for today's card and is one of the cool chipboards designs from Scrapiniec. I love it and I really enjoyed making today's card. Since I like using my markers and now the embossing powder with these well made chipboards, I wanted to create a galaxy background. Well more or less the idea of a galaxy. I used Aqua Flow pens from Tonic Studios and also some glitter silver embossing powder to add a cool texture and color to my chipboards. It is a very simple looking card, yet one of my favorite ones! Over at Scrapiniec you can find many other designs, perfect for any project and if you are looking for some inspiration on how to use them, then visit Scrapiniec. Our team is super talented! Thanks to stopping by today! Have a great day! I'm so super happy to share today's creation,because I have some news. I'm a guest designer for Stampotique this month. If you don't know, Stampotique was my very first design team ever and I had a great experience with them and I'm so happy to be back in their family as guest designer. They have unique designs and they have reasons to celebrate,because they just reached 300 challenges over at Stampotique Designers Challenge. The theme for my first and upcoming card will be the number 300. I used ''Flying Monkey'', one of my favorite designs as the main focal point and for the number 300, I used some number dies from my stash to create a background. I like it even if there is no sentiment. Sometimes I don't feel like adding a sentiment to all cards. I hope you enjoy today's post. If you want to see my upcoming cards for Stampotique and not only, then please keep an eye on my blog and feel free to join their challenges. Thank you for stopping by! Have a wonderful day and stay safe! The sun is out, the birds are singing and I'm wearing a comfy dress . So, I'm ready to share today's card with you . I got inspired by an unicorn design and you can see what I mean over here. I know there is a die for this, but I don't have it. However, I still wanted to make something similar and I used the stamps from Gina K , Honey Bee stamps for the sentiment and some dies from Sizzix. Mine looks a bit like a kitty or a baby unicorn. But if you want to make yours, then you can play with smaller flowers and change the size of the other die cuts. I still like it and I think is a great idea to look through your stash before getting new materials, because sometimes you can easily create with what you already have. I hope you get inspired to try something new with your stamps dies . As always, thanks for stopping by ! Have a wonderful day!